The high quality Bag Toss conversion deck. (3) Navy Blue Bag Toss Bags, (3) Red Bag Toss Bags and the official Bag Toss rules. 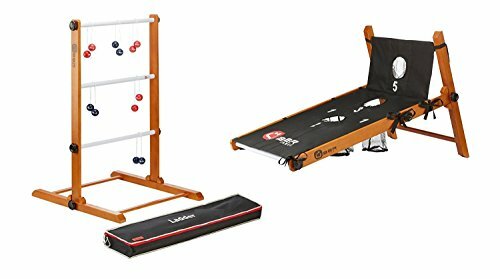 Regulation Tournament Ladder Ball dimensions - our ladder is 40 inches tall and 25 inches wide. The ladder base is 36 inches long and includes two cross supports. The three rungs are 13 inches apart and 24 inches long. Each bola has two real golf balls, 13 inches apart with solid brass fittings.